Mark Wilson/Getty ImagesMohammed bin Salman, Deputy Crown Prince and Minister of Defence of the Kingdom of Saudi Arabia, in the Oval Office at the White House, March 14, 2017 in Washington, DC. 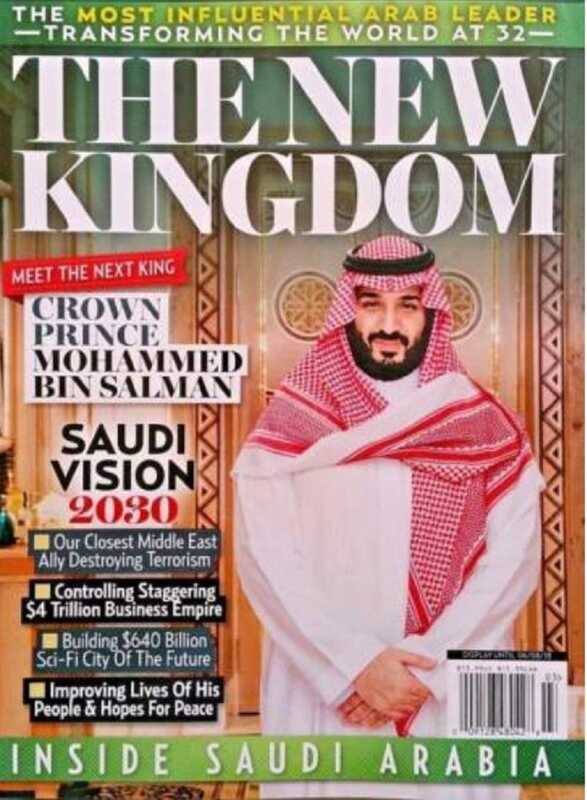 A major US publisher with links to President Donald Trump has released a nearly 100-page magazine devoted exclusively to praising Saudi Arabia and Crown Prince Mohammed Bin Salman. The magazine has been popping up at retailer across the US, and seems to be part of a reported multi-million-dollar global PR campaign to change the West’s perception of the Middle East country. The magazine coincides with the crown prince’s two week visit to the US. According to The Daily Beast, 200,000 copies of the title are available at major US retailers including Walmart and Safeway, and seems to be part of a reported million-dollar global PR campaign to change the West’s perception of the Middle East nation. The $US13.99 magazine, “The New Kingdom,” has been seen on new stands across the country, particularly in rural areas in Oklahoma and New Hampshire. American Media Inc. (AMI), which publishes popular US tabloids “The National Enquirer” and “US Weekly”, is behind the glossy publication. The CEO of AMI, David J. Pecker, has said he is a close friend of Trump’s and reportedly admitted to killing stories about the future president. The media giant claims it received no editorial or financial backing for the glorified portrayal of Saudi Arabia and the crown prince, despite the magazine appearing to lack the ads that would normally cover costs. “AMI’s only revenue from this product will come from newsstand sales,” he added. The cover also boasts that Saudi Arabia is America’s “closest Middle East ally destroying terrorism,” despite accusations that Saudi Arabia financially supported terror groups, like Al-Qaeda. Chris J Ratcliffe/Getty ImagesElectronic billboards show adverts for Saudi Crown Prince Mohammed bin Salman with the hashtag ‘#ANewSaudiArabia’ next to the A4 West Cromwell Road on March 7, 2018 in London, England. 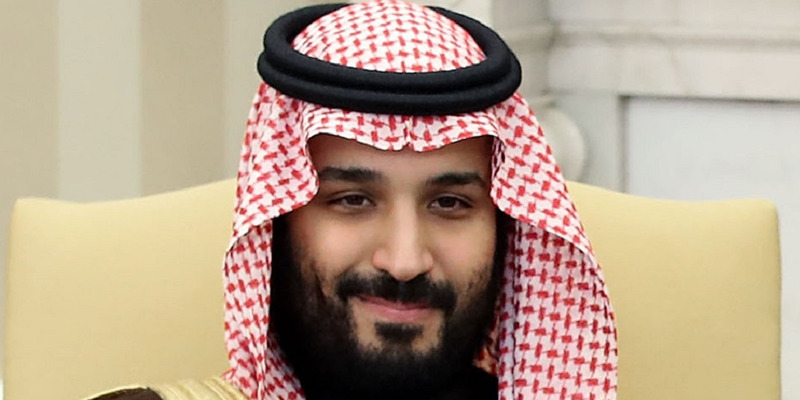 The Crown Prince this month embarked on a world tour to discuss bilateral ties with several Western powers but, more importantly, to garner positive press coverage for himself and his country. 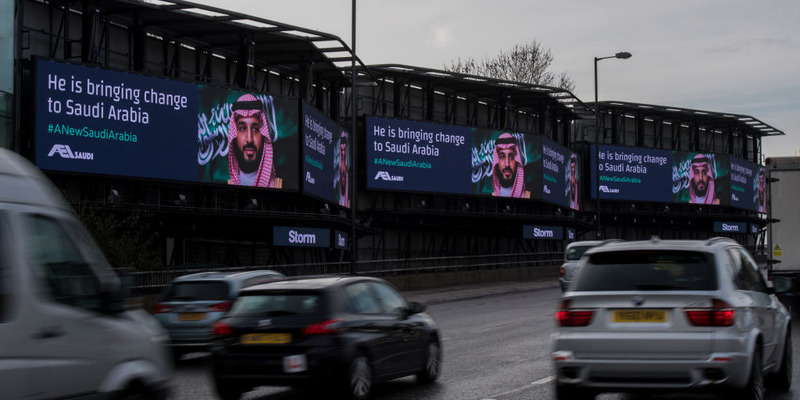 Before his widely publicized visit to the UK this month, a Saudi consulting firm reportedly invested millions into a media blitz with advertisements praising the Saudi leader popping up on billboards, taxis, trucks, and in newspapers. The prince discussed investment opportunities and trade deals with UK Prime Minister Theresa May, who barely challenged his country’s questionable record on human rights, and dined with the Queen and other members of the royal family, resulting in a perfect diplomatic photo-op. He employed a similar strategy for his US visit. “60 Minutes” aired an exclusive interview with the royal which has been panned as a “crime against journalism” for lauding his progressive views while lobbing softball questions on Saudi Arabia’s poor human rights record. Trump also met with the crown prince to discuss the country’s business dealings, and even brought over-the-top props for the occasion. 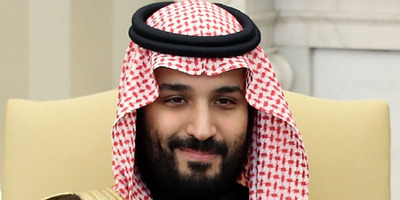 During his two week visit to the US, Prince Mohammed was set to also meet with heavy hitters from entertainment and tech giants, including Google, Apple, and Lockheed Martin, as well as Wall Street executives.